Are you traveling to India for the first time? If yes, the Golden Triangle Tour must be on your cards. We don’t want you to miss anything amazing while you are on the Golden Triangle tour in India. So, here we are with a complete list of 13 things you must do on the Golden Triangle Tour in India. Delhi is home to more than a dozen of historical monuments and landmarks including Qutub Minar, Humanyun’s Tomb, Lotus Temple, Red Fort, Lodi Gardens, Jama Masjid and many more to count. Commence your Golden Triangle Tour by taking a stroll to these ancient monuments that are a treat to visit. Plan a walking tour to Old Delhi to appreciate the true charm of the place. Witness the grand Jama Masjid, shop till your heart’s content in the markets for clothes, artifacts, handicrafts, books and taste the street food. Nizamuddin Dargah in Delhi is not-to-be-missed when you are on Golden Triangle Tour. Visit the tomb and experience the peace within. Get acquainted with Sufism and experience the serenity, away from the chaotic world. Don’t forget to try out the delicacies at nearby eateries. Delhi is a foodie’s delight, and when you are here, it is natural to taste delicious Indian food. However, wouldn’t it be amazing if you learn cooking Indian dishes and take this skill back to your country as a souvenir? Of course, yes. Learn some fantastic Indian recipes and gain knowledge about the centuries-old cooking practices. Taj Mahal is the most visited tourist destination of India, by foreigners and locals alike. The beautiful, historical monument that takes pride for all the tales of love looks all the more enchanting when viewed in full moon nights. This opportunity is available only five days a month. So, book our Golden Triangle Tour packages and get a chance to admire the magical beauty of Taj against the backdrop of a full-moon night. 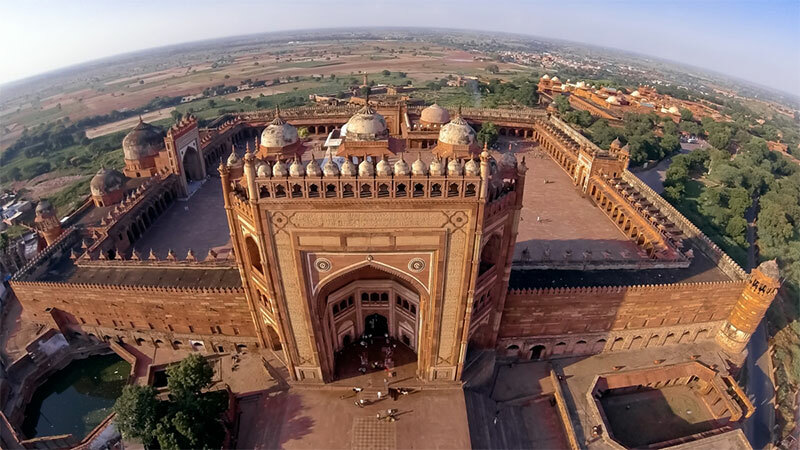 Fatehpur Sikri – a UNESCO World Heritage Site, often gets overshadowed by the beauty of Taj Mahal. But, the monument is marvelous for its charm and architecture. Take a stroll around the place and admire the detailed carvings, design and colorful bazaar. One of the best ways to understand the local life of India is to walk around a village and explore the sights. Once you have watched the beauty of Taj Mahal, you can participate in village walking tours around Agra and interact with the villagers about the rich historical significance of the place. Rajasthan – an important destination in your Golden Triangle Tour, offers you multiple opportunities to take an enchanting ride on the back of a camel. Whether you are at Jaipur, Jaisalmer, or Jodhpur, you can view the rural desert of India, its rustic charm at best through a camel safari. It is one of the most recommended activities to do when you are in Rajasthan – the royal state of India. The Thar Desert is undoubtedly one of the most popular tourist attractions around Jaisalmer, especially among foreign travelers. If you wish to enjoy the luxury of royal life, that too through camping, Jaisalmer is the best place. Stay out in the desert, go for a camel ride into the sunset, praise the beauty of dunes, watch the Rajasthani folk dance and feast yourself with the authentic Rajasthani cuisine. An elephant is the symbol of royalty in Rajasthan. Want to say hello to a tusker? Visit elephant farm in Jaipur and get a chance to feed, bathe and ride them. Try it once, you won’t regret the experience. Jaipur is world-famous for its colossal and magnificent forts and palaces. Want to take a bird’s eye view of the royal city? 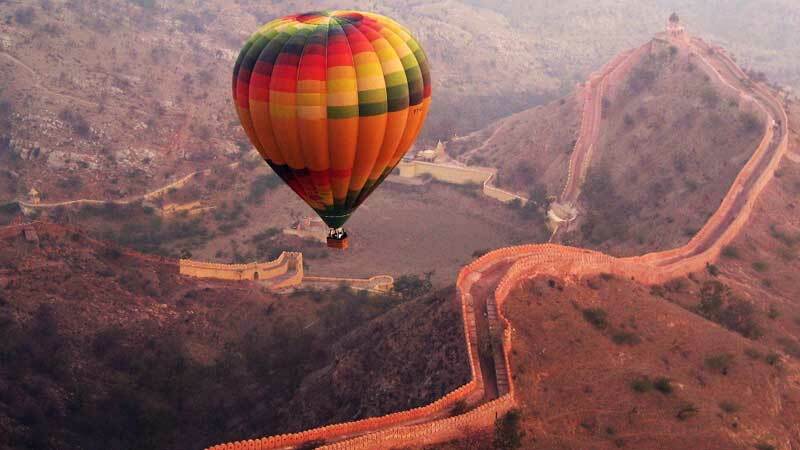 If yes, what can be the best way to admire the historical monuments, desert landscape, lakes and hills through a hot air balloon ride. Try this with our golden triangle tour packages, and you will cherish the memory throughout your life. Abhaneri, a small village near Jaipur, is home to a 100 ft. Deep step well, famously known as Chand Baori. 3,500 symmetric steps built over 13 stories offer a stunning beauty before your eyes. The intimate carving built all over the construction is another reason to visit the place. An offbeat yet important destination, it is advised not to miss the spot when you are on a Golden Triangle Tour in India. The wonderful and spectacular block printing is one of the most celebrated arts of Rajasthan. The good news is you can have hands-on experience of this stunning art at Sanganer village in Jaipur. You can also be a part of workshops which is offered by some factories. It allows you to create your specimens you can take pride of. India is a vast land with limitless things to do, watch, and experience. Want to taste a slice of India? Go through our Golden triangle with Varanasi Tour Packages and get a chance to witness the truly incredible India. To book a customized tour with us, or to get answers to your queries, contact us today! Tell us your experiences you want to enjoy in India and let us take care of the rest.